High up in the Chilean Atacama Desert, pioneering feats of human engineering collide with the majestic beauty of the natural world. 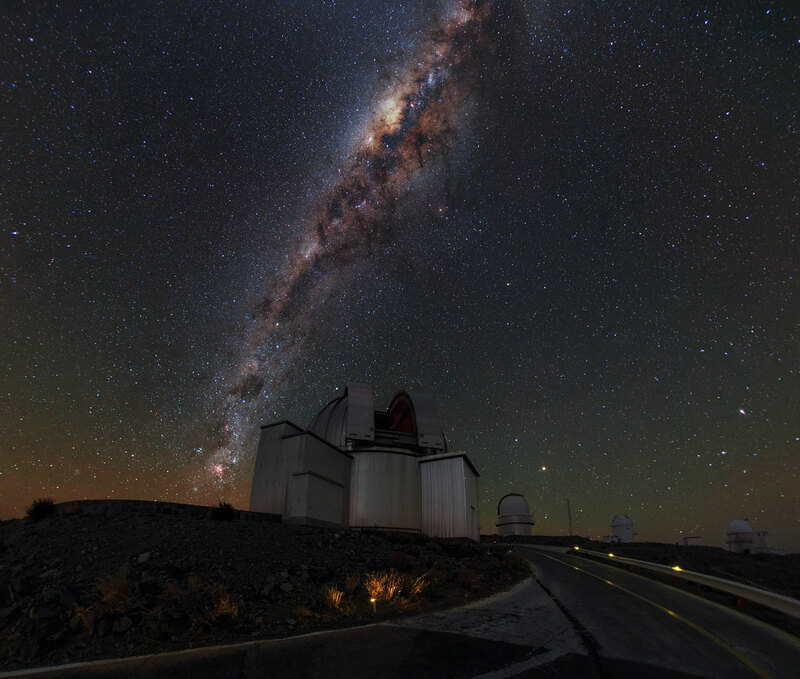 This image shows ESO’s La Silla Observatory, where domes housing some of the most advanced astronomical instruments in the world sit beneath a sky shimmering with stars. All of these stars belong to our home galaxy, the Milky Way. 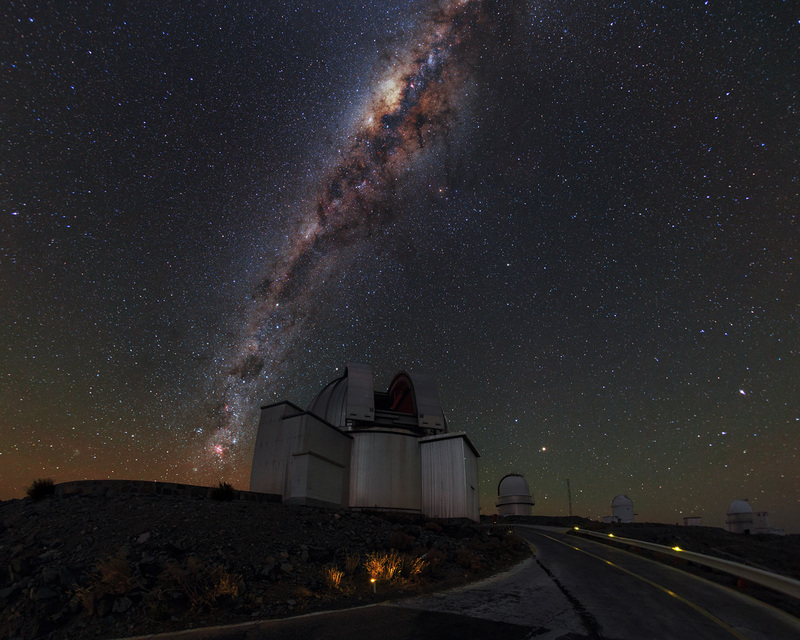 The Milky Way contains billions of stars, arranged in two strikingly different structures. 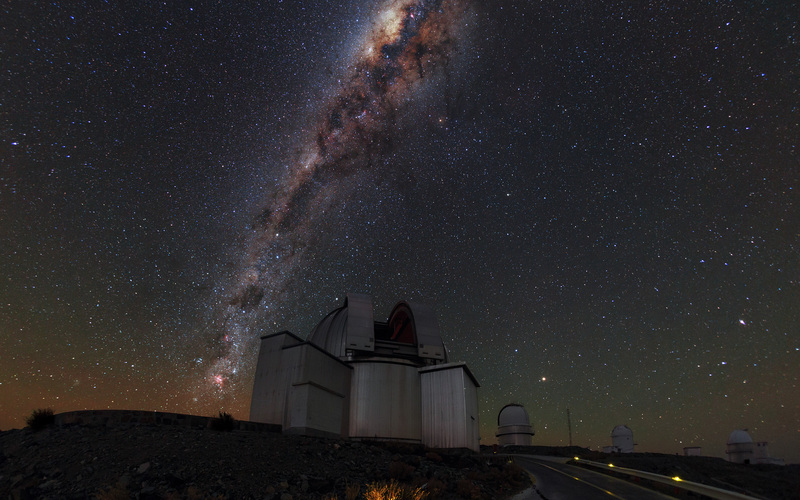 The roughly spherical halo component, consisting mainly of older stars, appears in this image as the background of stars scattered across the sky. The second component is a thin disc made up of younger stars, gas and dust. We see this as a dense, bright, and visually stunning band running almost vertically across the sky. Pockets of dust block out the light from stars behind, giving the band a mottled appearance. The bright concentration in the band of stars, located toward the top centre of this image, is the central region of the Milky Way. Here, astronomers have measured stars moving very much faster than anywhere else in our galaxy. This is taken as evidence for a supermassive black hole, some four million times the mass of the Sun, at the very centre of our galaxy. The black hole cannot be observed directly, but its presence can be inferred from the effect its enormous gravity has on the motions of these nearby stars.